In 1565 Guaman Poma(1) writes "Nueva Corónica y Buen Gobierno" a chronicle addressed to Philip III, King of Spain that means to denounce the mistreatment of indians. The chronicle lost its way in the trip and appeared in the late 1600s in Denmark where now is kept in the Royal Library. Many illustrations in it, captured my attention the first time I read the book. In "What is Critique?" Foucault writes how the Church pastoral: "developed the idea that each individual, whatever his(sic) age or status, from the beginning to the end of his life and in his every action, had to be governed and had to let himself governed, that is to say directed towards his salvation by someone to whom he was bound by a total, meticulous, detailed relationship of obedience. And this salvation-oriented operation in a relationship to the truth: truth understood as dogma, truth also to the degree where this orientation implies a special and individualizing knowledge of individuals; and finally, in that this direction is deployed like a reflective technique comprising general rules, particular knowledge, precepts, methods of examination, confessions, interviews, etc. After all, we must not forget what, for centuries, the Greek church called techne technón and what the Latin Roman church called ars artium. It was precisely the direction of conscience; the art of governing men." This analysis of Foucault on how the pastoral brought up a different way to relate to power, took me back to one of Guaman Poma's illustrations. 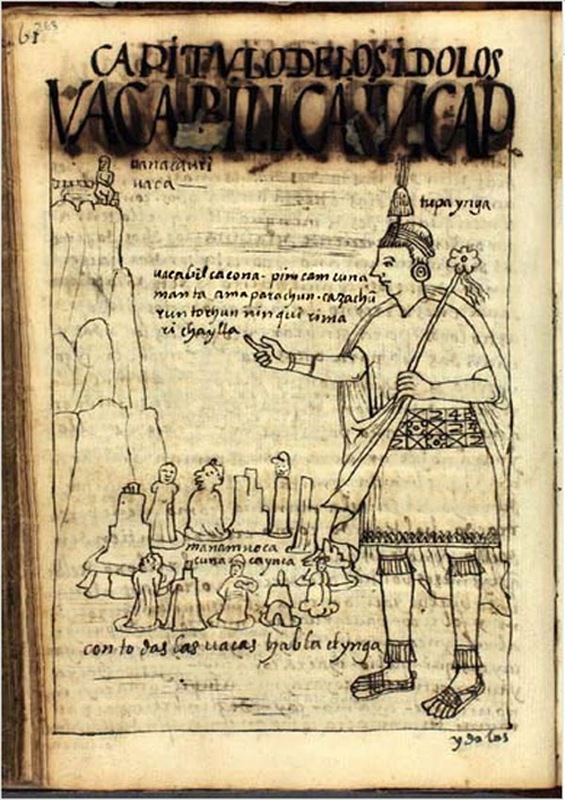 In the Chapter of the Idols (deities of the Inka), we can see the Inca confronting the different Wak'as, in account for what should be their duty: to take care of the runa (the people) in exchange of the runa taking care of them. The Inka interpelates them: "Whom of you has said "'may it not rain, snow, hail'? speak! That is all." The Wak'as excuse themselves: "It wasn't us, Inka". 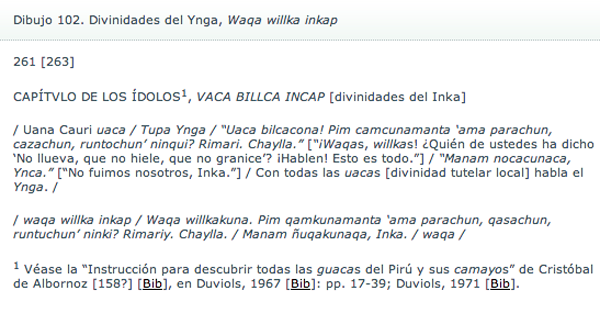 Guaman Poman finished the page writing "With all the Uacas (local tutelary deity) speaks the Inka." These days the political struggles in Spain and other countries of the South of Europe are addressed against the austerity measures of the Troika. This has translated into a constant questioning and a call for disobedience as a way to question and resist the authoritarianism of the government and its repressive measures. In the light of todays events, a critique of the current democratic system in its shaping towards authoritarianism should be paired, complimented and infused by decolonialism because of its critique of the modes of life, of our ideas of inhabiting the world, of government, and our relationality to others. Disobedience, it is going to be your fault that I am happy. (1) I find a particular relation to Guaman Poma in the fact that he writes this chronicle of the new government without being fluent in Spanish. Fluent in Quechua and Aru, he went on to become literate in Spanish, the hegemonic language, but never achieving a perfect grasp of Spanish grammar. It is also worth to notice that the author lived most of his life in Huamanga, Ayacucho, the department that suffered the most of the State violence and Subversive violence in the 1980-2000. Rolena Adorno writes how all of Guaman Poma's property was confiscated and how he was banished from Huamanga, an event that led to his travels throughout the country and most likely to the construction of his masterpiece. (2) Alternative writings to Wak'a: Huaca, Uaca. Huacas as archeological locations are quite ubiquituous in Peru. In fact the campus of the first university of the New World, the Universidad de San Marcos, coincides with the Maranga complex, which has archeological rests also inside the Zoo and the Pontificia Universidad Católica.